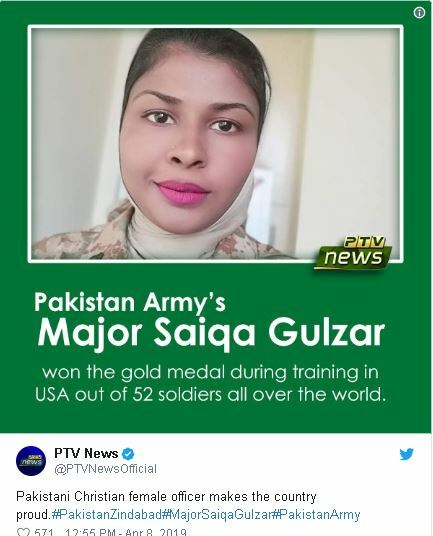 Pakistan Army’s Christian Major Saiqa Gulzar wins a gold medal in training in the USA amongst 52 other soldiers. 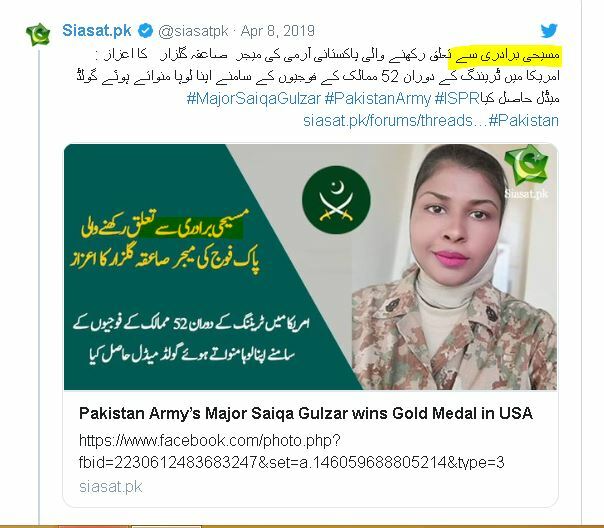 ISPR was quick to cash in on the achievements of this young lady from the minority Christian community in Pakistan and propagated this news all over Pakistan Media. , However, it is interesting to note that no details on what training and which all countries participated in this training activity. 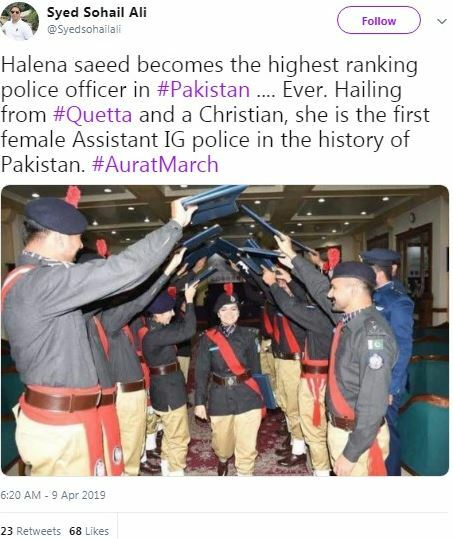 Nor has the host country released any such detail with respect to specific training of women officers at their location and Pakistani Women Officer bagging a gold. The video below shows all women officers/ soldiers from the Pakistan Army only. No details of training or other participant countries are listed anywhere. So a Pakistani officer toping amongst 52 other Pakistani soldiers is a big feat? Isn’t an officer usually supposed to have a higher IQ level than a soldier? Or is it the other way round in Pakistan Army? This news seems to be rather fabricated for various vested reasons. Firstly, the officer is a “Christian” is mentioned all over the print and social media. Does Pakistan Army discriminate on the bases of religious sect or community? Mentioning her name this way reflects poorly on the socio status of minorities in Pakistan. More so happening to an Army officer is proof of the bias faced by many in the organization rank and file. Back in 2006, all indications were that the Pakistan Army was planning to incorporate/induct women on a large scale. But that did not happen. Why the military hesitated to go any further? Most women in the military are today employed with the sole aim to treat the patients; out of almost 4000 female officers serving in the military 3000 are employed in the AFNS(Armed Forces Nursing Services). Over 600 are female doctors in the AMC(Army Medical Corps). The remaining women serve as female officers on non-combatant roles in the ISPR, Signals and Engineering departments of the military. Are women in Pakistan less capable of adopting the manly qualities of a soldier? The problem is not that the women are not dying in Pakistan. Those forced into marriages against their liking, victims of acid throwing, child marriages and even those who are married to Quran; most are sidelined to live abnormal lives. There are others who are routinely raped, killed and some are even murdered in the name of honor. Does it hurt when women in Pakistan die in such situations? If it does then it should hurt less when those who volunteer to serve their nation lay down their lives for the sake of their country. Why is it that only the men are allowed to harbor ambitions such as serving and dying for their country? Is it not only fair to provide the women also with such opportunities where they are encouraged to serve their countries putting their lives at stake as well? Arguably women are more capable, perhaps even more efficient and effective to perform a range of military-related duties. They can also be employed in female alone air defense units considering Pakistan military deploys a large number of air defense units to safeguard strategic assets. If military can overcome its gender subordination mindset it might as well than find reasons to induct increased number of women in the armed forces. To do that it will have to forgo the recruitment conditions of women being postgraduates and over 28 years old and train them for a full two years instead of six months training that they are currently put through. Lastly, what is it that the all men army has achieved for us that the women cant; by recruiting more women in the military the state may move one step forward to end gender subordination. This may also be one strong measure to effectively respond to the world economic forum Global Gender Gap Report that ranked Chad, Pakistan, and Yemen as the worst of all the countries as far as gender gap is concerned. Pakistan Army instead of glorifying community-based achievements should lead the way to actually empower women in all fields of employment. To cut the long story short, first Pakistan should ensure that clerics like the one in the video below are jailed for spreading toxic anti-women speeches. It is because of these clerics that conservative movements are by far more popular than the progressive women’s movement in Pakistan. Some scholars explain the appeal of these faith-based organizations as a channel for women to exercise agency and autonomy by pointedly embracing a non-Western form of womanhood. It’s a wrong definition of empowerment. Its adherents also avoid the shame, pressure, and physical threat that secular feminists regularly face. They have the support of religion and acceptance in society, so they are in expansion. So the big question is there any women empowerment happening for real? It is interesting to see how indigenous culture in Indonesian archipelago plays its role as a basis of a moderate type of Islamicity. How education, especially modern social sciences shape up the views of clerics, scholars and intellectuals. There is a need for framing a similar moderate-progressive Muslim culture for spreading openness, growth, peace and harmony. Pakistani & Kashmiri women too can break the bubble and make a mark for themselves without hurting religious sentiments. What is required is a change in the thought process, a strong drive, a unification model which would bind all strengths and negate all negativity spewing to stall growth of women in the name of religion.